Maximise Resource Utilisation Deciding what to test is only one part of the puzzle. Figuring out when, where and who should be testing is key to effective planning. Build these factors into your test cycles and maximise your utilisation of your test resources. Shared Visual Coverage Metrics Visual representation of requirements and test coverage gives QA engineers insights into quality that most teams never get anywhere near. Aiding collaboration with BA's and customers this capability helps the QA team work on what's important to the people that matter most. Open Test Management Delivers Integration All components of the test process come together in one test management tool. With the ability to link requirements, defects, changes and automation SilkCentral gives you one open platform for supporting your manual test efforts across the project lifecycle. Reporting and monitoring at different levels Visibility across projects and teams is essential to good test management. Real-time monitoring of QA tasks and activity for distributed teams gives the team real insight into progress and quality. Define Quality Goals and Mitigate Risk Define goals to address perceived risks and see how testing is addressing those risks. With the capability to assess risks based on priority and then assign testing tasks to compliment those priorities you have the ability target your testing where it's needed. On average, 40% of software requires rework, 50% is delivered late, and 68% is never even finished. Coders make errors on occasion, and at times those errors cause major problems. This is why project teams implement test management solutions. With the right testing infrastructure, you can go someway to avoiding rework and missed deadlines. One of the preferred solutions for agile and traditional projects starts with Silk and ends with Central. This test management system uses collaborative, requirements-based testing, making activities, progress, and results accessible to the whole team. With powerful traceability and great usability, it is easy to see why SilkCentral Test Manager is one of the best ways to manage your QA projects. SilkCentral offers all of the features that you would expect from a top end test management solution, and more. With requirements driven and risk based testing methodologies, SilkCentral allows you to deliver the best possible quality management approach for every project. Testing is usually requirements driven, meaning that tests are changing as a consequence of constantly changing requirements. SilkCentral simplifies the way you oversee this process. In addition with risk based testing you have the opportunity too, to align testing with present business risks. In this way the most pressing issues are resolved first. Real time reporting and collaborative capabilities mean that your development team can chase down problems earlier in the development cycle, and the new dashboard and web support make it all easy to access. A customizable personal dashboard takes it a step further, giving you the information you need and making collaboration between testers and test managers a snap. Good reporting is of no use if the data entered is of poor quality though. Ensuring the entry of good quality data is down to user uptake. And user uptake depends on ease of use. With SilkCentral you’ll find one of the easiest user interfaces to learn. Yet this delivers the power and flexibility to grow as your teams experience grows. The only way to determine whether Silk Central makes sense for your organization is to use it. We can help you do just that. Sign up for a free trial. You will have it within the hour. Whilst the user experience sets SilkCentral aside from the competition you’ll still find a tool jam packed with features that support testers and promote good testing practice. The benefits of this are clear to see. Planning– central to good test planning is the ability to specify the what, where, when and who part of your QA efforts. 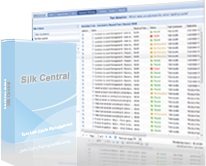 SilkCentral brings these components together to help you take control of your test cycles and manage your resources. Unified Framework– Test cases have never existed in isolation. They link, relate and interact with requirements, defects and other artifacts of the development process. With requirements visualisation you’ll find it much easier to validate requirements. Prioritisation– No team has all the resources at their disposal to test everything. With risk based prioritisation and mitigation capabilities you have the ability to respond to demands and needs of the business. Issue Recreation– a significant amount of the testers time is spent detailing how to recreate issues they’ve found. With video and image capture Silk can simplify this process with background recording whilst tests are executed. Configuration Traceability– tests usually need to be run against multiple configurations or in different environments. The desire to trace this information can lead to complex and time consuming data entry. This is all simplified in Silk with the reuse of scripts for different environments. Reflecting the way your organisation works, SilkCentral delivers an open architecture that scales to help you deliver higher quality products. With a raft of new features in version 12.0 you now have advanced planning, video capture and enhanced assignment capabilities at your finger tips. With SilkCentral, you can increase the quality of your applications and avoid delay and rework. With unparalleled usability and accessibility you’ve got the tool of choice for many major QA teams. Don’t believe us? Join a live web demo or sign up for an SaaS trial and see for yourself how SilkCentral can help your projects.